Native American Zerviah Gould Mitchell (1807-98), a direct descendant of the Great Sachem Massasoit who in the last years of her life resided at Betty’s Neck in Lakeville, deeply felt the injustice to which Native peoples in Massachusetts were subjected, and this resentment instilled within her a resolute, even defiant, attitude towards racial injustice and its perpetrators. As an educated and intelligent woman, Mrs. Mitchell must have regarded with deep irony the circumstance of mid-19th century radical abolitionists agitating for an end to slavery and the enfranchisement of African-Americans nationwide, while Native Americans in the Commonwealth remained barred from equal citizenship because of their race. Since the end of King Philip's War (1675-76), Massachusetts Natives had been treated as wards of the Commonwealth which appointed guardians to oversee Native affairs. Despite a somewhat nebulous paternalistic social welfare component to the state's guardianship, the system, nonetheless, effectively deprived Natives of the civil liberties freely enjoyed by the white populace. 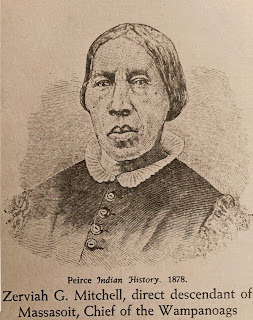 Mrs. Mitchell first challenged the Commonwealth's system of institutionalized racism when, in 1857, she sought to have the guardianship removed from four lots of land she claimed in the Troy (Fall River) Indian Reservation, and payment for the timber removed by the guardian of the Fall River Indians, Benjamin F. Winslow. Winslow was an opponent of Native equality, opining in 1848 that Natives "would receive no benefit from the privilege of citizenship, if conferred upon them." In Mrs. Mitchell, he found a formidable foe. The Commonwealth's Commissioner of Indians, John Milton Earle, apparently impressed by Mrs. Mitchell’s intelligence and determined demeanor, would write of her in 1861: "She is a capable energetic woman, a member in good standing of a Christian Church, and is represented to be entirely competent to the management of her own affairs. She neither desires nor needs the Guardianship under which the Indians are placed." Between 1857 and 1861, Mrs. Mitchell sought to undermine the guardianship system, and while the Commonwealth early on recognized and upheld her claims to the Fall River property, it was more difficult to get Winslow to comply. Many at that time (and some even as late as 1930) characterized Mrs. Mitchell's case as one motivated by purely pecuniary concerns. Fellow Natives on the Fall River Reservation resented her claim to a full eighth of the entire reservation, and were disturbed that she "had taken liberties not heretofore allowed or claimed by any other member of the tribe." The ensuing hostility which was directed towards her was probably not discouraged by Winslow. Little did the Fall River Natives recognize in her legal charges a critique of the Commonwealth's guardianship system, nor did they comprehend that it was to be part of the ultimate undoing of that system, an outcome which would be realized within a decade. In 1869, the guardianship of the Massachusetts Natives was finally removed by "An Act to Enfranchise the Indians of the Commonwealth," by which the state's Natives were accorded the same rights and privileges as her white citizens. But though, through this Act, Massachusetts Natives may have gained equality before the law, they did not gain equality in the eyes of all of the Commonwealth's citizens, a cause for which Mrs. Mitchell would continue to struggle for the remaining years of her life. 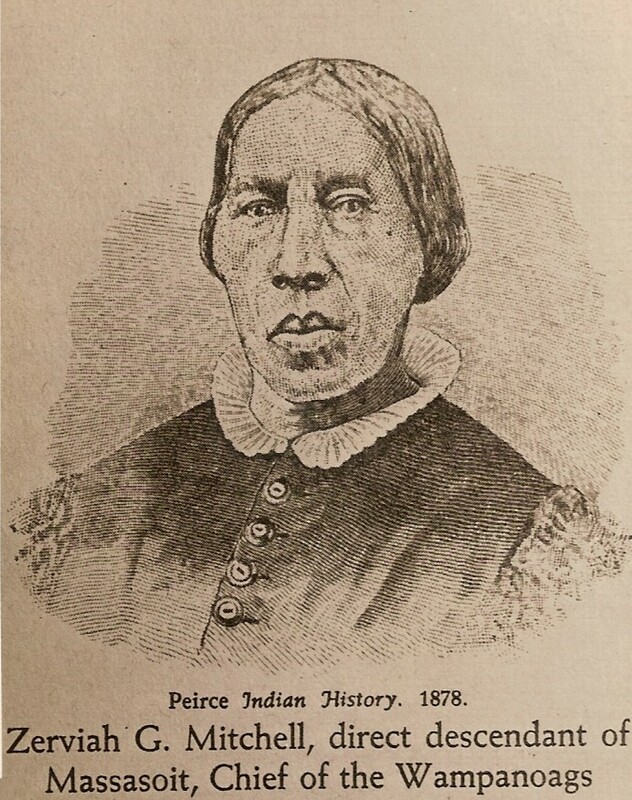 In 1878, she published her Indian History; Biography and Genealogy, Pertaining to the Good Sachem Massasoit of the Wampanoag Tribe, and His Descendants, authored by Ebenezer W. Peirce. With this work, Mrs. Mitchell was able to strike yet another blow in the cause of racial equality. Depicting her Native ancestors as men and women of dignity, honor and integrity, in sharp contrast to long-held negative stereotypes of Native peoples, Mrs. Mitchell was successful prompting a reconsideration of Wampanoag history and a thoughtful reevaluation by introspective whites of their previous conceptions of Native peoples and Native history. Writing in the preface to the work, Mrs. Mitchell stated - "Before going to my grave I have thought it proper to be heard in behalf of my oppressed countrymen, and I now, through the medium of the printing press, and in book form, speak to the understanding and sense of justice of the reading public." To the end of her life, her nemesis would be social injustice and racial inequality.